It's In Other Words Tuesday. I was originally going to host today but we made an adjustment. I will host next Tuesday and Loni of Writing Canvas is hosting today. Difficult times are hard enough to deal with. But sometimes the reactions of people make it harder. I think of Job's friends who thought they were being good friends. Unfortunately they weren't much of a comfort as they questioned why these bad things were happening to Job. Sometimes difficulties can be the result of consequences of sin and poor choices. But sometimes life happens. After all, we live in a far from perfect world this side of eternity. And our difficulties can't always be reasoned and explained. I've been going through a season of challenges. This has caused me to be so much more sensitive to others going through similar circumstances. In the past, I may have been one to stereotype or consider someone foolish if they found themselves in these circumstances. But I'm realizing that's not always the case. I'm so thankful for the comfort and help I've received as I go through difficult times. My prayer is that I would be able to help and comfort others with the same comfort I received. How about you? Are you more sensitive to others when you've experienced similar tragedies or challenges? I have to say yes. There have been times where I really was down and thought life could not go on. Through those times I have learned and believe I have more compassion if would have not went through those times. One other thing: I am ready to share what I went through if people want to hear how I got through. All I can say: His grace. Debbie, unfortunately Christians (many of them) have a knack for offering their unasked for opinions, in a way that portrays they are the experts. I often think of Jobs friends, incidentally, who God was very angry with. Only because Job interceded for them, to hold back the hand of judgment, did God stay His hand. We need to be sensitive to the Holy Spirit at any time someone is going through trials and tribulations... because our perception of their struggles can be immensely different to God's perspective. We can do more harm than good when we shoot off our mouth in our own importance. I pray you find relief and resolution to your struggles my dear friend. He is perfecting you through it all, bringing forth the treasure within, even more. You and I have had these types of email and in person talk so you know how I feel about COMPASSION. That's huge for me. I remember all that GOD delivered me from and that causes me to be extra sensitive to the hurts of others whether caused by their own decisions or by decisions made for them or things done to them. My priority is to pray for them, share truth (the Word) with a tongue laced with grace while pointing them to the ONLY ONE who can help them -- JESUS. You chose one of my favorite Scriptures in 2 Corinthians. Love ya! AMEN! to all three comments and your post! I have found God has used many things in my life to give me greater compassion for others. I believe He allows us to see things from the inside out - a heart transformation if you will on a daily basis if we let Him have His way with us. Then in turn we can share the goodness of God for others to see and taste. It really is a beautiful thing to see a surrendered heart and watch God move mountains for them! God has a way of calling us on our judgmental attitudes, huh? I'm with you. I need to speak less and listen more. Definitely. I do find myself more compassionate and less judgmental when I've been through similar hard times. I think sometimes we say the "stupid" things because we have not walked the road and don't know what to say (and inevitably do not know how much our words can hurt). This is definitely an area God has been refining in my life, often painfully refining. Thanks for sharing sweetie! It's just a matter of time before every believer gets to wear the "Difficult Shoes". And until they (I) do, compassion & understanding will be incomplete. Years ago, during a particularly difficult stretch, I found myself wondering if it really wasn't some blessing in disguise. I began thanking God for trusting me to handle the trouble (though I sure didn't feel like it), and for sustaining me in/through it. As I look back, that's exactly what it was: a blessing, and in so many ways. You're walking it out with grace and courage, my friend -- even when you don't feel it. I see it all over you! In it all, we grow, we learn, and we become more of what He wants us to be, just as you are Debbie, and it is showing beautifully in your life! Everything I have ever walked through, He has led others across my path to walk with them through the same. When things get tough or difficult, I cling, cling to His Word. It is the only thing that will never fail me and His promises are true forever. And when I reach the other side, wrapped in His victory I know there will be someone somewhere that will need my experience to cling to Him as well. Just call me mustard seed gal! What a wonderful post & topic Debbie! And YES, I have been through so much in my life as a single mom, bad choices & needing forgiveness from my family and especially myself. It seems that forgiving myself was actually the hardest & final step. I also know that I've grown the most during those painful, difficult times. 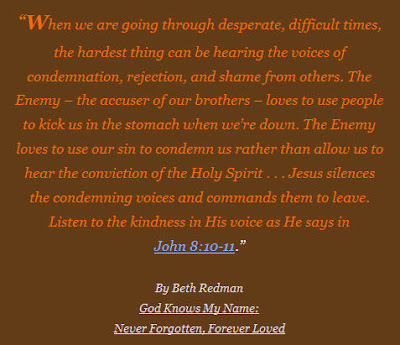 Praying throughout the day, as the enemy constantly tried to condemn me through other people & my own thoughts. I've been able (through my own experiences & empathy for others because of it) help several other single moms. GREAT POST...something we all need to be reminded of. Hang in their Debbie, the difficult lessons you're learning now will be used to help others later. Someday your trials will be a blessing to someone who feels alone in their similar struggle. I don't always have the right words to say that would comfort people, but I try to be there for people to show them my love, and care and tell them I'm praying for them. I'm grateful for the people who've helped me along my journey. I really do try to be kind and considerate to others. Honestly, we never know what someone is going through. Boy it sheds a whole different light on the subject when we go through things others have experienced. I can be a very eye opening experience. Thanks for sharing today it was really awesome to read. I guess I've had my share of trials in life, as have most of us. The problem with Job's friends was, they did not have had a similar experience, (luckily few of us had been tried like Job). They came to comfort, but ended up hurting him deeply. I fear I may have done the same. I often talk faster than I think, and I am so ashamed over the damage I may I have caused. I try to be grown enough to admit my shortcomings and ask for forgiveness. I think it's a great difference between premeditated evil and hurtful actions caused by lack of wisdom. I also hope that my trials have made me a wiser and a more empathic person. 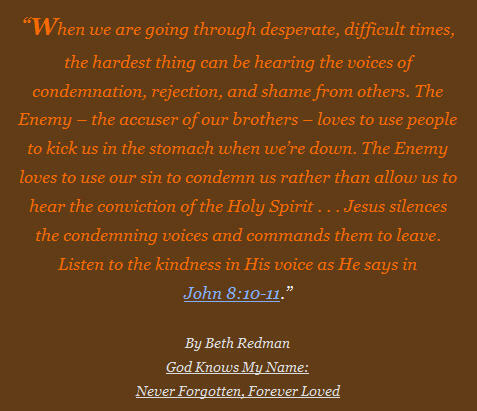 Even more I hope that reading what my blog friends are going through,likewise makes me more understanding and able to say a prayer or share a word in right time. a better perspective; so that the only judge I make, is I shall not judge. Wandering by your side has brought me so many new aspects of life, because you so willingly share of your experiences of walking with the Lord through a dark valley. I admire your ability of seeking the light everywhere and your stamina to your motto for this year. Thank you for sharing both wisdom and faith. Having met you, and receiving your kind and encouraging comments on my blog have helped me experience your compassion and understanding. I do appreciate reading your posts, they come from a deep well, that's clear to see.